The French (and Dutch, for that matter) love their flavored syrups. Mixed with water or ‘limonade’ (French lemonade, similar to Sprite or 7up), they make a very refreshing drink which is especially popular with children. 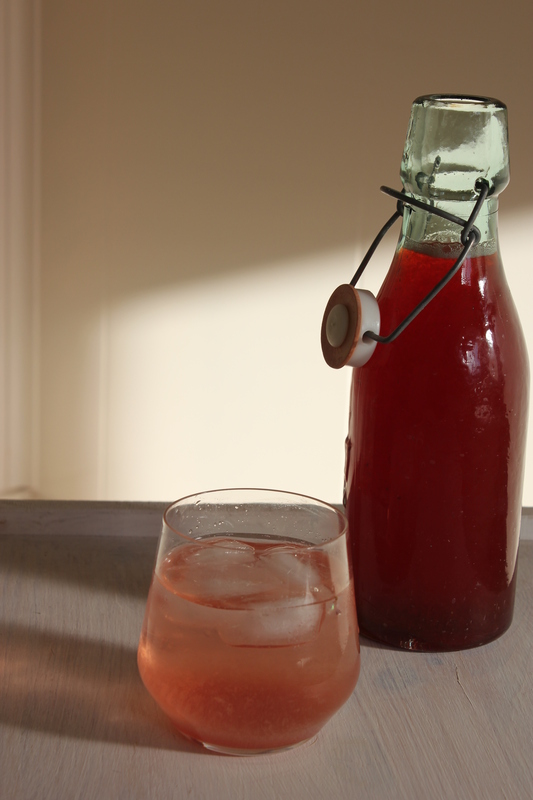 This strawberry syrup is not only great in a diabolo fraise, one of my daughter’s favorite drinks, but you can also pour a little over yogurt or ice cream. Sometimes I even freeze the syrup in ice cubes and add a few to a glass of sparkling water. Feel free to try the recipe with other fruits. Roughly chop the strawberries, put them with the sugar and water in a pan and bring to the boil. Stir well, reduce heat to a simmer and gently cook for 30 minutes, stirring occasionally. Allow the mixture to cool in the pan. Strain into a bowl, making sure to squeeze as much syrup out of the fruit as possible. Using a funnel, transfer to a glass bottle. Refrigerate before serving. To serve, mix 1 part syrup with 4 parts water. I finally had a day off yesterday. The next issue of DUTCH is pretty much on its way to print, my next column for En Route only needs some polishing, and I have rounded off a few interesting translating assignments. So what did I do during my ‘breather’? I started with a long run. It was fabulous weather, so I really went for it. It felt like I was flying! Unfortunately, I think I need to cut down on my sessions a bit because later that evening my knee was killing me. I honestly don’t know how I slept. Major bummer. It’s better today but still not 100%. Good reason to schedule an appointment with the physiotherapist, which is what I did this morning. Before the knee pain hit. however, I had a chance to give the house a good scrub. The French doors were filthy! As I was scrubbing them I wondered why I had gone running — it was one heck of a workout! But all my efforts were well worth it. By the end of the day, the house was tidy again, the floors were clean, I had done several laundries… and I even managed to squeeze in baking a cake! One with booze! For those of you who aren’t Dutch or don’t live in the Netherlands, the cake has brandy-soaked apricots, known as ‘boerenmeisjes’, which translates to ‘farmer girls’ . It is a popular treat in the north of the country and usually enjoyed in a small glass on special occasions. It i also used to top pancakes or ice cream. For added color, I added in some fresh raspberries. 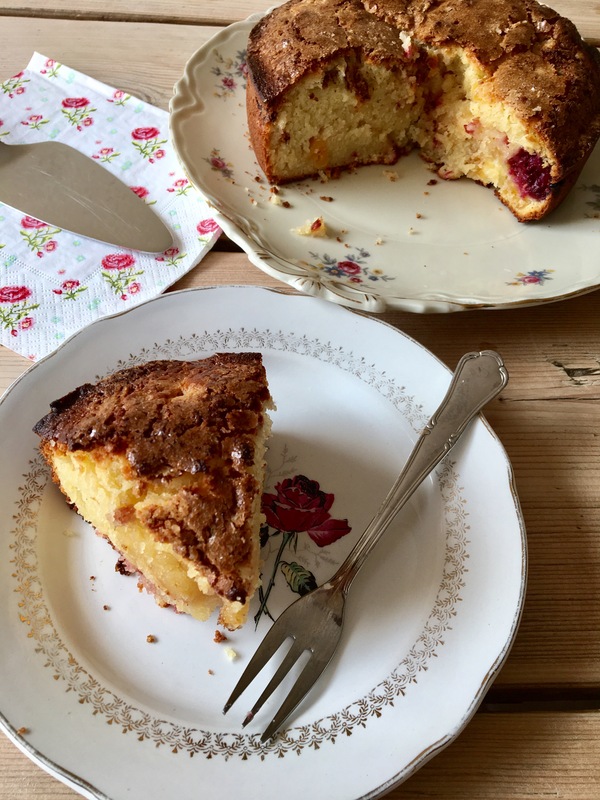 The cake has a lovely tender crumb and is perfect with tea in the garden on a sunny day… or scarfed on the couch with one’s feet up after a long day playing Cinderella! Enjoy! Butter and flour a round 20cm springform tin and preheat the oven to 180C. Cream the butter and sugar with a standing or hand-held mixer until pale and creamy. Add in the brandy from the boerenmeisjes and the eggs one by one while continuing to beat. Fold in the yogurt using a wooden spoon. In a bowl, combine the baking powder with the flour. Fold the dry ingredients into the wet. Fold in the boerenmeisjes and raspberries and pour the batter into the tin. Sprinkle with the 2 tbsps sugar. Pop into the oven and bake for approximately 40-45 minutes or until a skewer inserted in the center comes out clean. Allow to cool before cutting. 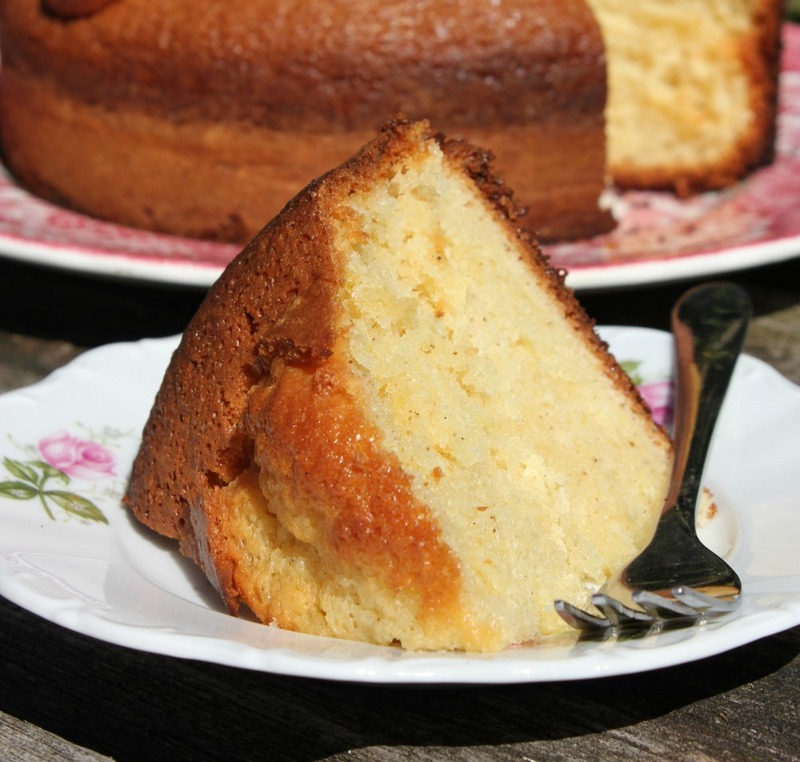 In France, the gâteau au yaourt is a true classic and part of the repertoire of all home cooks. There’s a wonderful simplicity about this cake. Even children and the most novice of cooks can make it with excellent results. 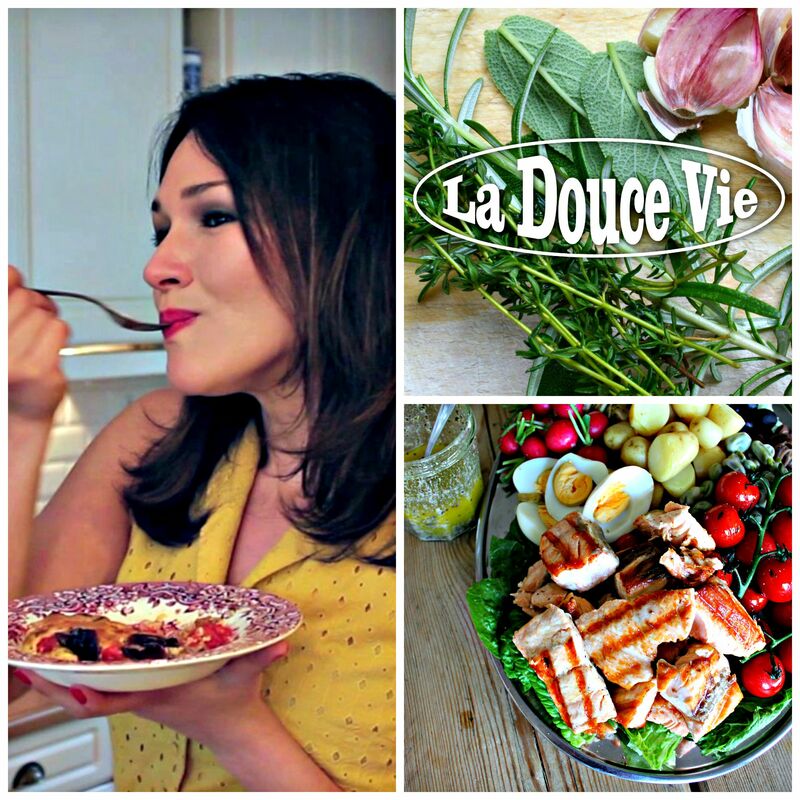 All of the main ingredients are weighed with a pot of yogurt, hence the name. But the charm of this beautiful yogurt cake is in its tender crumb and versatility. You can flavor it with citrus zest, stir in some fruit or serve it with Nutella or jam. A Twitter friend, Jeremie, suggested stirring in blackberries, assuring me it would be a “taste of heaven”. Though the cake is suitable for almost all occasions, I like to serve it with tea, on pretty plates with a dollop of crème fraîche, fresh strawberries and perhaps a few shavings of dark chocolate. By the way, you can replace the yogurt with sour cream, Greek yogurt or even crème fraîche. All would work beautifully in this cake. Note: Check the 20 minutes into the baking time to make sure the cake is not getting to brown. Should that be the case, cover with aluminum foil. Preheat oven to 190° C. Lightly grease a 20 cm springform tin, and dust the sides with flour. In a large bowl whisk all of the ingredients until thoroughly mixed and the batter is smooth and satiny. Pour the batter into the prepared tin and bake for 40-45 minutes or until a toothpick inserted in the center comes out clean. Let the cake cool on a rack before unmolding. Christmas is just around the corner and I’m so excited! This past Friday we officially kicked off the holiday season with a wonderful Thanksgiving dinner with friends Marit and Kelvin and my son-in-law (well, it kind of feels that way already!). After a huge turkey dinner, we all cozied up on the couch to watch one of my favorite Christmas movies, National Lampoon’s Christmas Vacation — so, so funny! It was a lovely evening with a highly festive feeling. We even had eggnog and twinkly lights! 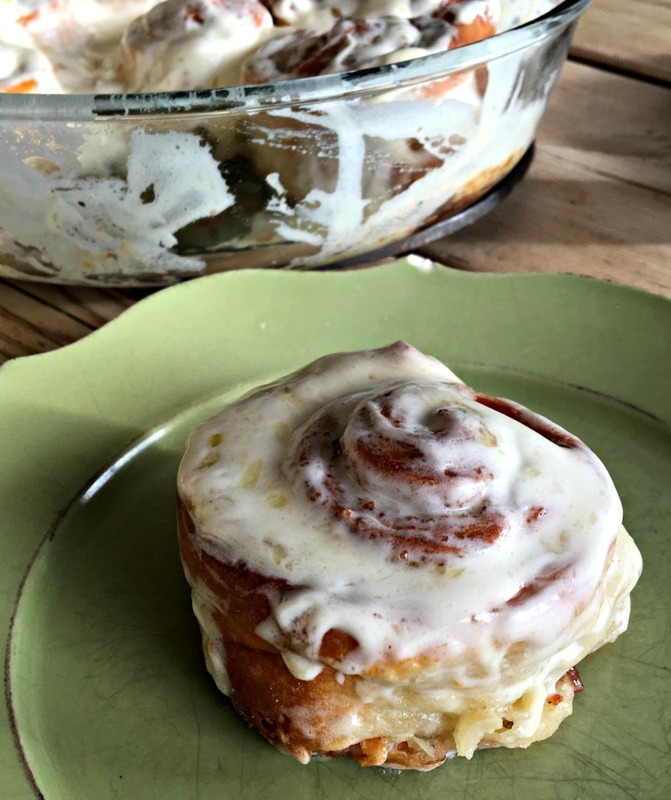 There are a lot of cooking plans brewing in my head, and today I want to share one that I tried this morning — my easy cinnamon rolls made with ready-made croissant dough! This recipe saves you a lot of time, so it’s definitely one to keep in mind this busy holiday season. I hope you’ll like them as much as we did! Preheat the oven to 180C. Open the tube of dough on a well-floured surface. Cut it in half with a sharp knife and join the two sheets to make on large sheet of approximately 31 x 11 cm. Brush a little of the melted butter over a round Pyrex dish. Brush a little more of melted butter over the dough. 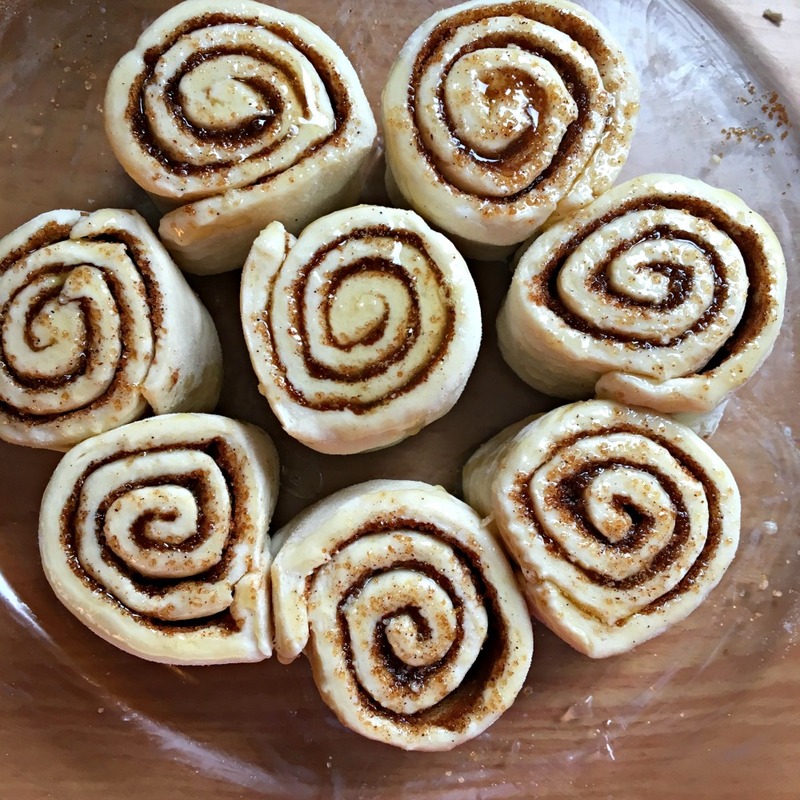 Mix the sugar with the cinnamon and sprinkle over the dough. Roll up the dough into a log, from the small side. Place the rolls in the pan with the seams touching and brush with the rest of the melted butter. Bake for 25 minutes. 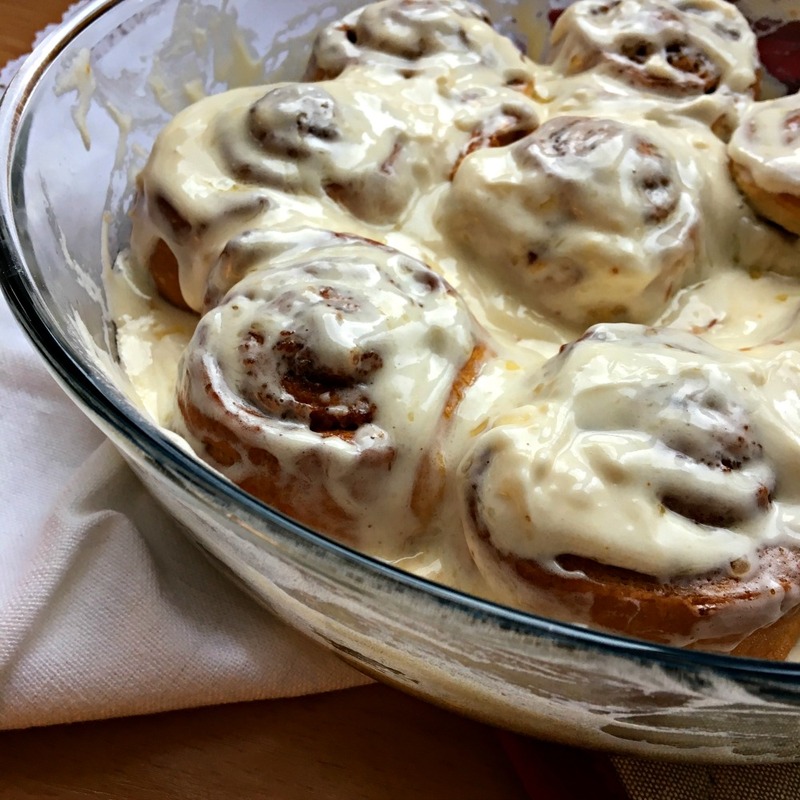 Make the glaze by whisking the softened butter, cream cheese, powdered sugar, lemon juice and vanilla. Spread this over the rolls as soon as they come out of the oven. Delicious!